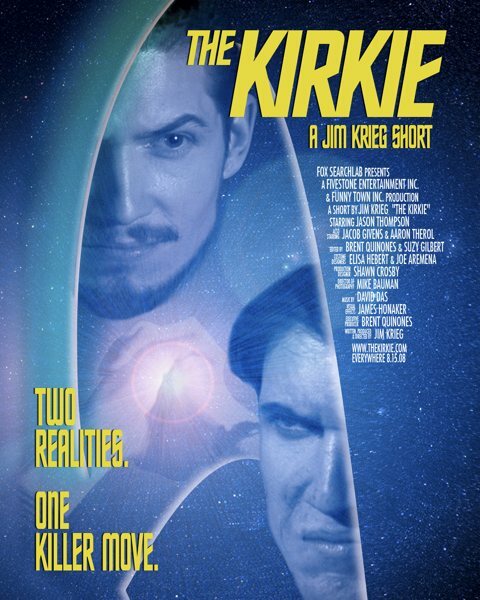 I was privileged to write the score for Jim Krieg‘s fantastic short film The Kirkie, a spoof of all things Star Trek, Star Wars, and Battlestar Galactica. The film has been a hit at ComicCon, and what greater accolade can one aspire to? The Kirkie, in the words of one reviewer, “revels in its geekiness.” It’s a story about three sci-fi devotees who, while on their way to a sci-fi convention, get sidetracked, improbably thrust into a dream world in which they reenact a fight scene clearly inspired by the very worst dramatic fight scenes from the old Star Trek TV show. Then the movie comes to a head when the lead character gives the evil alien “the kirkie,” a dramatic fight gesture that Captain Kirk often ended alien battles with. Writing the score for a film like The Kirkie was an endless amount of fun, because by and large, the sonic genre is already quite defined: it’s the world of the epic John Williams Star Wars score crossed with the comically overdone scores of the Star Trek TV show (most scored by Alexander Courage, Fred Steiner, and a few others). To write effective parodies of such classic and well-known genres requires a bit of skill and a lot of humor to be able to use those styles but turn them around for comedic effect. During the writing of the score, Jim fed me a steady diet of Star Trek TV show box sets and similar to immerse me in that world. My favorite cue is the fight scene, with its dramatic over-angular writing that seem so dated by today’s standards but now, when viewed through the prism of the original TV show, give it a 60’s sci-fi character. Working on a film like The Kirkie is a little like watching Leslie Nielsen parody movies; everything is overdone, yet overdone with great care, love, and imagination, which perfectly summarizes genius writer and director Jim Krieg’s work on this film.